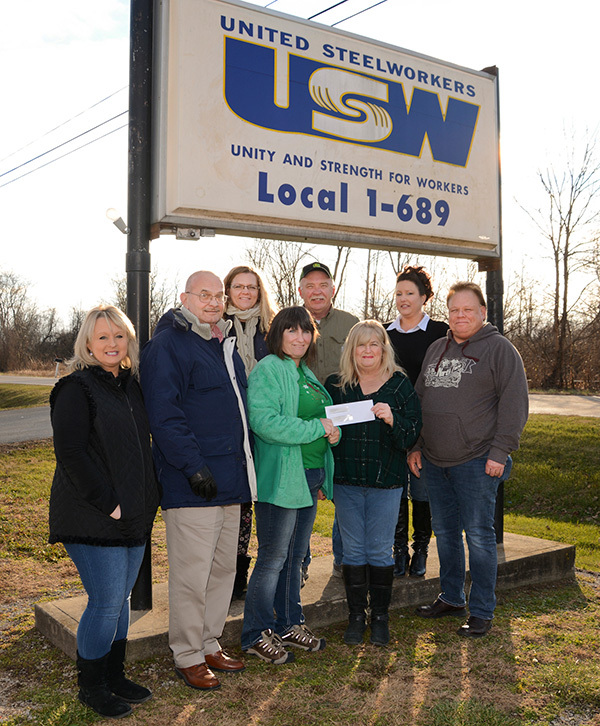 PIKETON, Ohio – On Dec. 14, United Steelworkers’ (USW) Local 1-689 Women of Steel donated $400 to the Food Program and Clothesline of Jackson in Jackson, Ohio. Approximately 250 families a month are given food from the pantry’s shelves. Shown at the recent presentation from the USW Local 1-689 Women of Steel donation to the Food Program and Clothesline of Jackson County are, from left, Theresa Workman, Jeffrey Dalton (Food Program and Clothesline of Jackson), Andria Smalley, Nancy Baisden (Food Program and Clothesline of Jackson), Lou Thompson, Francie Mullins, Jodi Jenkins and Mark Veach. Not pictured, Lisa Jenkins, Brook Pyle, Melissa Sammons, Sandy Stanley and Jeri Trent. The pantry was formed by the Jackson Area Ministries, and became operational about 40 years ago in Jackson. They’ve been in their current location at 276 E. Main Street for the past 26 years. Five days a week, employees and volunteers at the pantry distribute some of life’s necessities to the needy. Volunteers from several different churches help staff the facility. Recipients are referred by area churches and social service agencies such as Job and Family Services, American Red Cross, the Health Department and area churches. Manager Nancy Baisden said about 90 percent of their clients return for help every 30 days.